At a Kansas City, Mo., Municipal Court hearing Sept. 20, Oblate of Mary Immaculate Father Carl Kabat of St. Louis learned the prosecution had dropped the property damage charge against him. The court set the date of Oct. 12 for Kabat’s trial concerning his trespass July 4 on the site of KC’s new nuclear weapons parts plant, almost completely constructed. Kabat assured Judge Elena Franco he was pleading not guilty. “Ask them!” said Kabat. “They want a low profile.” He pointed to his waist, saying that was how high he cut the chain-link fence with bolt-cutters to enter the site late July 3. He spent the night on the property, sleeping as he leaned against a utility pole, and then walked over the 178-acre site until a guard met him near the front entry. Kabat, who turns 79 on Oct. 10, participated in the first Plowshares action, when the “Plowshares 8” poured blood and hammered on nuclear weapon nose cones at the King of Prussia GE site in Pennsylvania in 1980. 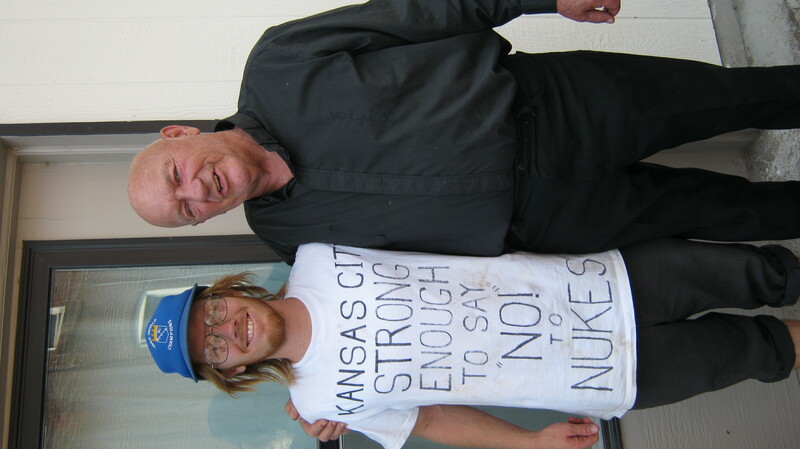 Kabat’s fulfillment of Isaiah’s prophesy, “They shall beat their swords into plowshares,” includes the 1984 action in which he and three others used a jackhammer to damage the concrete lid over a Minuteman missile 45 miles east of KC, near I-70. For that, Kabat served 10 years in prison. Kabat broke probation this July 4 in returning to the site of his action the prior July 4, and he never paid the $200-plus fine for the 2011 infraction. Franco said that during the trespass trial Oct. 12, she would consider the parole violation and fine. For the new trespass charge, Franco noted, Kabat could get a $500 fine and six months in jail. 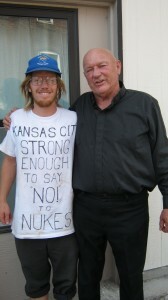 Franco selected Oct. 12 at 1:30 p.m. for Kabat’s trial because the same two witnesses for the prosecution will appear that afternoon for another anti-nuke trial, with defendants Midge Potts of Springfield, Mo., and Kabat’s advisory attorney Henry Stoever of Overland Park, Kan. Potts and Stoever did civil resistance at the new nuke-parts site April 14. Like Kabat, they are pleading not guilty to trespass. Two others in the April 14 action—Lu Mountenay of Independence, Mo., and Mark Kenney of Omaha—pleaded guilty and were sentenced to community service. For more information, contact Jane Stoever at janepstoever@yahoo.com.